About our Pou, Te Hono. Introducing our Board of Trustees. There is a notice coming home today as a reminder about our ‘Meet the Teacher’ sessions TOMORROW. 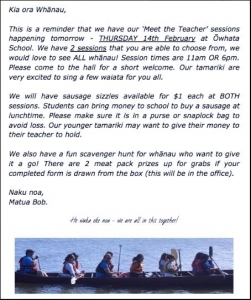 We are doing a lunchtime and evening sausage sizzle so tamariki are able to bring $1 to school. Read the notice for more info, please! We are aiming for 100% attendance from whānau – we would love to meet you all! He waka eke noa – We are all in this together! Board of Trustees information evening. Maori Northland Sovereign Queen on Another awesome article in the Daily Post! Copyright © 2016 Owhata School. All rights Reserved.